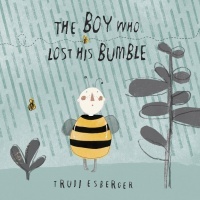 The boy in this debut picture book is fascinated by the bees in his garden, and is puzzled and saddened when they disappear one rainy day. What can have caused them to leave, and is there anything he can do to get his bumble back? Nothing he tries is successful, but things start to look a little brighter with the arrival of Spring. A gentle, quirky introduction to the cycles of nature, with an important and highly topical message about the value of bees to our world. Uugghh! A Slug! Slug feels completely unloved by the world, and can’t help feeling it may have something to do with appearances. Happily, new-found friend Spider is on hand to explain that beauty is in the eye of the beholder. Debut picture book about a rabbit artist who vanishes, but lives on in his work.